NYC-ARECS Activities - "Hurricane Sandy"
The Military Auxiliary Radio System (MARS) is a United States Department of Defense sponsored program, established as a separately managed and operated program by the United States Army, Navy, and Air Force. The program is a civilian auxiliary consisting primarily of licensed amateur radio operators who are interested in assisting the military with communications on a local, national, and international basis as an adjunct to normal communications. MARS has a long history of providing worldwide auxiliary emergency communications during times of need. 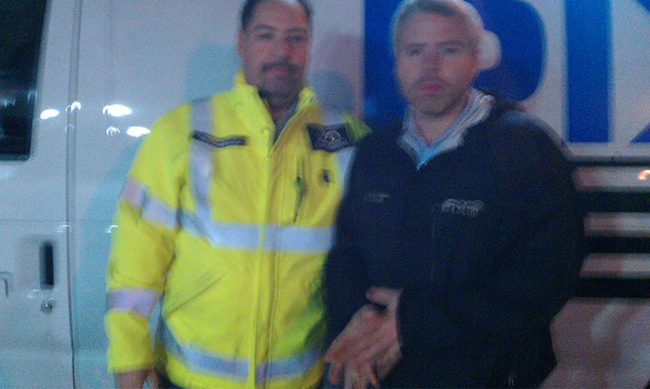 Photo: Shelomo Alfassa, NYC-ARECS Public Information Officer with Greg Mocker, NY PIX 11 News Reporter. Alfassa was interviewed during hurricane Sandy on the corner of Avenue P and Coney Island Avenue in Brooklyn, as Coney Island was being inundated with seawater and the local police precinct was being evacuated.